All communication was professional and informative. We enjoyed staying in a home away from home. One of our party talked with Suzanne twice. House needed light bulbs and we received them the next day - very pleasant and accommodating. 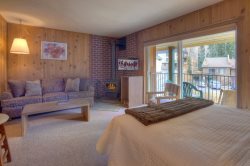 The property was clean, comfortable, professionally decorated and mere steps from the heart of downtown Durango; it was the cornerstone of a quite enjoyable trip. Nice secluded property close to Purgatory. Worked great for our family of 4 summer vacation. Directions and instructions by email were complete and sufficient. They saved time in the long run compared to other rentals and properties which sometimes require checking in and out and additional paperwork. Overall we enjoyed the property and our time in Durango immensely! Thank you! Excellent group to work with. They were very responsive. It was enjoyed by everyone. We would go there again. Team was great! Easy to work with, always helpful and informative. wonderful- thank you very much! We enjoyed The property. The condo was well appointed and equipped and easy to get to. Also very clean, the one garbage can aside. The only negative issue we had was when we got there the place smelled like rotting garbage that smell stayed for several days because of that issue next-door with a neighbor who had left rotting garbage which permeated into the property where we stayed but the management do their best to accommodate us and in the end it was not too much of a problem Very sorry for the inconvenience of the mess next door. We responded as quickly as we could to figure out where the smell was coming from.